American Express is one of the world’s most recognized credit card brands. For years, consumers have relied on the flexibility American Express embodies. Its traditional charge card makes it easy for cardholders to enjoy the finer things in life. These days, AMEX maintains its edge with great product offerings, including the Business Card from American Express OPEN. 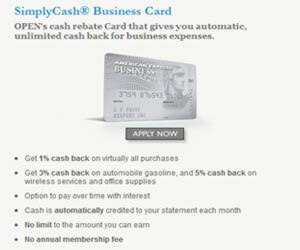 Here are a few of the many reasons a business of any size may benefit from this -or any other AMEX business card offer. No shortage of rewards found in the AMEX SimplyCash Business OPEN business credit card offer, including no annual membership fees, 3% cash back for fuel and if you have a fleet of vehicles, you know what that equates to. Also, 1% applies to any other purchases and an impressive 5% cash back on phone services and office supplies. The best part is that your cash back is applied automatically to your credit car statement. If you’re looking for a 0% intro credit card, then the SimplyCash option has you covered in that aspect, too. For twelve months, you’ll enjoy your account and make purchases with no APR. After that, a variable rate applies and is based on your credit history. An excellent credit rating ensures approval. One reason the AMEX SimplyCash is the first choice for many business owners is the ample benefits that may not seem significant at first glance, but once you use them, it becomes clear the value of such perks. For instance, you’re afforded the Global Assist Hotline exclusively for AMEX users. It’s like a lifeline when the unexpected occurs. From emergency card replacement to checking on your OPEN Savings account, purchase protection, travel accident insurance – your problems or questions are handled quickly by a team of friendly staff members. The travel and emergency assistance team can you help you plan your trip. From finding tickets to a show in an unfamiliar city to booking different hotel accommodations, they’re right there to assist you through your entire trip. Signing up for paperless statements ensures an electric bill lands in your inbox each month and the 24 hour account access through the American Express website allows you to know in real time the status of your account. Also, there are no expiration dates on your earnings, no annual limits on how much cash you earn and the extended warranties on major purchases give you that peace of mind you need. Wondering how the SimplyCash stacks up against other American Express products? Here’s a look at how it rates against another popular AMEX choice, the Business Platinum by AMEX. As you’ll see, the benefits are many, but the differences might help you determine which credit card offer best meets you needs. The Business Platinum card offer includes up to $200 in airline fee credits. These can be used for the many incidentals that are just part of today’s modern traveler. Plus, it can be used on any airline. Like the SimplyCash, the complimentary concierge service is a great way to keep your travels flowing smoothly. From an unexpected change in plans to the need for dinner reservations, one call covers the bases. Also, you’re automatically enrolled in the Membership Rewards First program, which allows for even more benefits and a no preset spending limit keeps your mind free to go about the business of running your business. The annual fee associated with the Business Platinum card is $450 and is the major difference between the two offers (SimplyCash has no annual fee). On the other hand, because the Business Platinum AMEX is a classic charge card, there are no APR considerations since your balance must be paid in full each month. Finally, there’s a slight difference in what criteria is used to gain approval. While the SimplyCash AMEX requires excellent credit, the Business Platinum has a “good” rating requirement, so that may be a factor in which offer you ultimately select. Whichever offer you decide to pursue, the one common denominator is the American Express brand. It represents exclusivity and success – an image any business owner wants to ensure. Apply for these or any other American Express card product easily and with a instant decision.